Do you know that Homalomena Rubescens flowers? Plant type: An ornamental perennial foliage shrub, native to Tropical Asia and America. Light: Semi-shade to full shade with preference to bright light or dappled sunlight. Moisture: Moderate to low water needs. Soil: Any container soil mix that can hold adequate moisture, yet well drained and aerated. 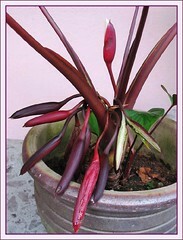 Care: This is one of those easy-care houseplant that is undemanding. It’s recommended to give it dappled sunlight and keep soil evenly moist, but if the foliage begins to yellow, you’re probably overwatering or plant is lacking nutrients. Fertilize once monthly during the growing season with a foliage houseplant fertilizer. 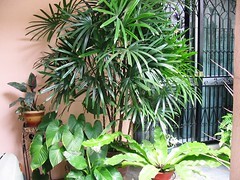 If grown indoors as a houseplant, regular misting probably 3-4 times weekly of its foliage during hot seasons will maintain its beautiful appearance. 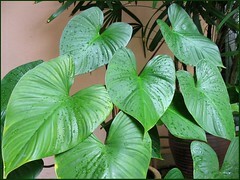 Try to keep its foliage free of dust by dousing or washing regularly to keep it healthy. Keep an eye out for infestation of aphid, scale or mealybugs, though it’s unlikely. 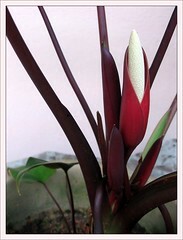 Usage: It is excellent as a houseplant as well as an interior decorating container plant in offices and hotels. Can be used as a standalone in patios or amongst other plants to form a crowd. Great too as an ornamental landscape or groundcover plant for woodland garden or any shade gardens. For sub-tropical & temperate regions: Ooops, not many related links to choose from? But since Homalomena is closely related to Philodendron, looking quite similar and needing the same conditions as it does, this educative Philodendron link may suffice, I hope. However, do check here to enjoy Abrimaal’s story-telling images of his lovely Homalomena Rubescens plant and explore further into his awesome site to gain more insights on Aroid plants. We too didn’t know earlier that this ornamental foliage plant, Homalomena Rubescens (Roxb.) Kunth will produce flowers! Late November last year, we were pleasantly rewarded with a first bloom and subsequently emerged another 10 more blooms in succession within 1.5 months! How fascinating and exciting! Tradescantia pallida ‘Purple Heart’ or ‘Purpurea’ is simply irresistible!